White Rabbit Lasagna. Once in a while, my husband will roast a whole rabbit. 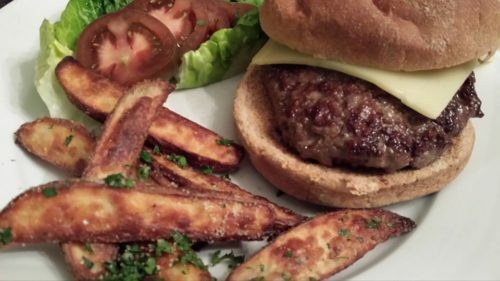 He’ll usually serve it with a grainy mustard sauce, some wild rice, and maybe a side of honey buttered carrots. 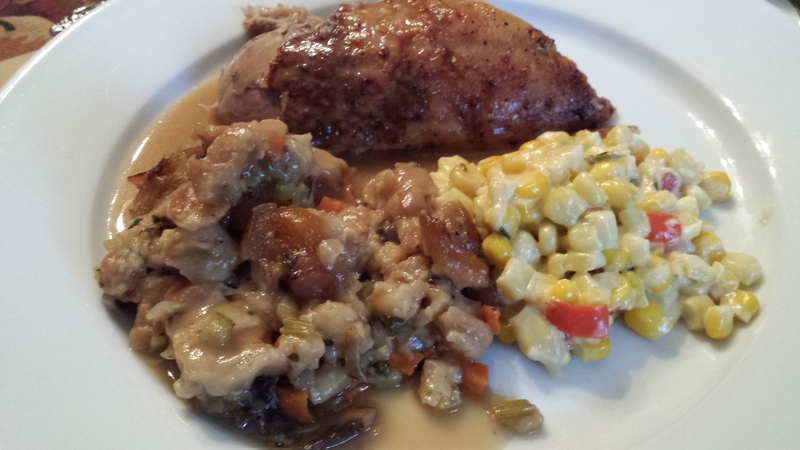 I had some leftover rabbit meat from a previous meal and wondered what I could do with it. It’s hard to find rabbits for cooking in our area. There is a stigma attached to eating the “Easter Bunny.” Whole Foods Markets carried rabbits for a year or so until public backlash caused them to stop. 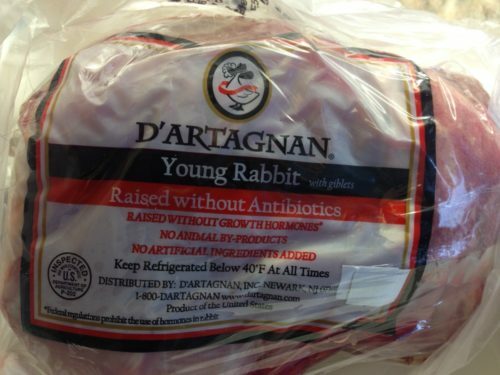 Once in a while, we can find a whole fresh D’Artagnan rabbit at our local Giant Food grocery store. Whole Foods had a better price though. Now what to do with that leftover rabbit meat…? One of my favorite restaurants in the world is Lapin Saute in Quebec City, Quebec, Canada. 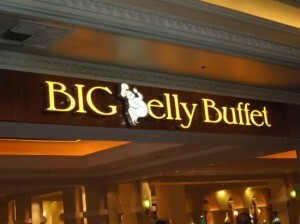 It’s a quaint little restaurant that serves delicious rabbit dishes. The rabbit “lasagna” with camembert cheese sauce and roasted cherry tomato confit was a favorite of mine on our last visit. 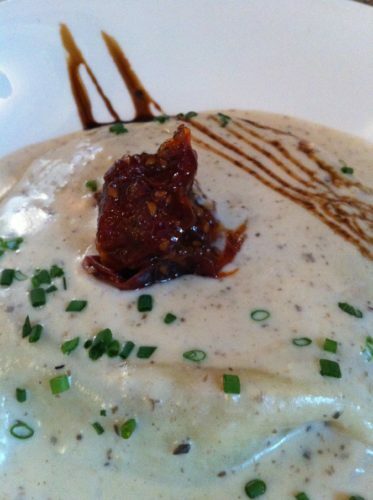 Why not make my own White Rabbit Lasagna based on the original at Lapin Saute restaurant? What a great idea! 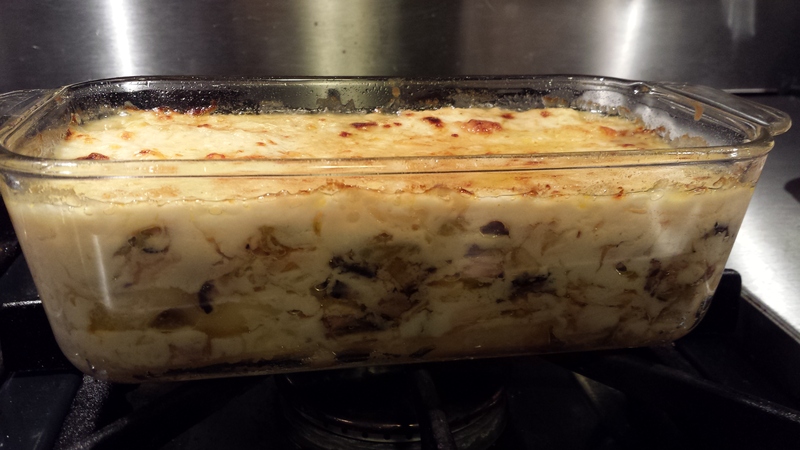 This recipe is also a modified version of my White Lasagna. Instead of using prosciutto ham, I’ve substituted cooked rabbit meat, mushrooms, thyme and shallots in the filling. 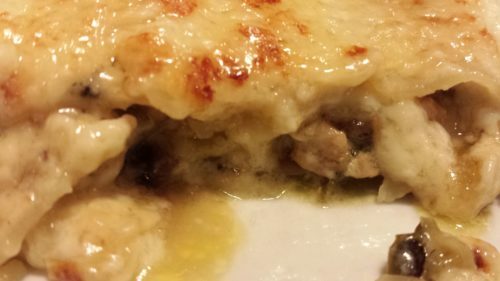 Simply make a white Bechamel sauce infused with camembert cheese (see recipe below). 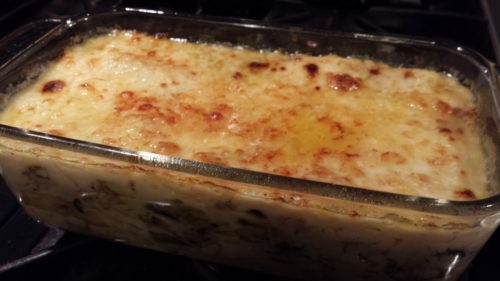 Layer four no-boil lasagna noodles with two layers of the rabbit mushroom shallot mixture, the camembert Bechamel sauce, Havarti cheese, and a middle layer of fresh ricotta and shredded Parmesan perfumed with freshly grated nutmeg. 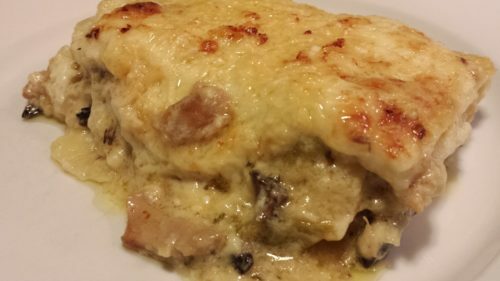 Cover the layered lasagna with the camembert Bechamel sauce. Bake, covered in foil, until the center is hot and the lasagna is bubbling. Remove the foil, add some Havarti slices, and broil until the cheese is bubbly. Remove the lasagna from the oven and let sit a few minutes before slicing and serving. I call it “white rabbit lasagna” because I don’t use tomatoes or a red sauce in a “white lasagna.” This lasagna pairs well with a dry rose wine or a dry white wine such as a Chardonnay. 2. Make the camembert Bechamel sauce: In a saucepan over medium heat, melt the butter. Whisk in the flour to make a roux and cook for a few minutes to remove the taste of the flour. Whisk in the milk and the chicken stock. Stir in the onion. Add the bay leaf and paprika. Simmer over low heat and whisk periodically until the mixture thickens and so the bottom doesn’t burn. Remove the bay leaf. Turn off the burner and whisk in the diced camembert cheese until the cheese is incorporated and the sauce is smooth. Set aside and keep warm. 3. In a saute pan, warm the olive oil. Saute the shallots in the olive oil until the shallots are translucent. Add the chopped cremini mushrooms and the thyme and saute until the mushrooms have softened. Add the rabbit meat and warm through. Set aside and keep warm. 4. Mix together the shredded Parmesan and ricotta cheeses. Season with freshly ground nutmeg. 5. To assemble the lasagna, spray a 9 x 5 loaf pan with cooking spray. Ladle enough Bechamel sauce to cover the bottom of the pan. 6. Add a no-boil lasagna noodle. Spoon half of the rabbit mixture onto the no-boil lasagna noodle. Add a bit more Bechamel sauce and top that with two slices of Havarti cheese. 7. Cover with the second no-boil lasagna noodle. Spread the cheese mixture over the lasagna noodle. Ladle on some more sauce. Top with the third lasagna noodle. 8. Add the rest of the rabbit mixture spreading to cover the lasagna noodle. Add a bit more Bechamel sauce. Top with two slices of Havarti cheese. 9. Add the the last lasagna noodle and top with the rest of the Bechamel sauce. 10. Bake, covered with foil, for about an hour at 350 degrees Fahrenheit. 11. When the center of the lasagna reaches 170 degrees Fahrenheit, remove the foil. Cover the top of the lasagna with the last two Havarti cheese slices and broil until the cheese is bubbly and slightly browned. 12. Remove the pan from the oven and let sit for 15 minutes. Cut into two to four slices and serve. Use two spatulas, one on either side of a lasagna slice, for easy removal from the pan. Serve immediately. Serves 2 – 4 depending on size of slices. Offer with garlic toast and an Insalata Caprese or my Special Bittersweet Salad. 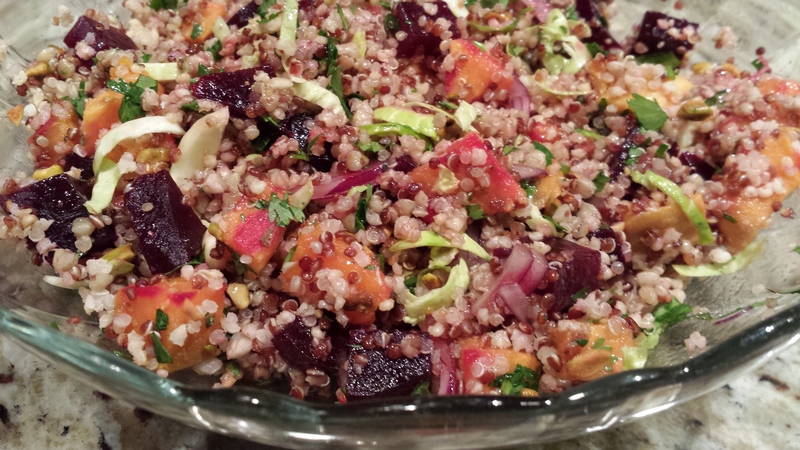 Serve with a dry white or rose wine. Variations: If you can’t find rabbit, substitute cooked chicken or turkey meat. Use any type of mushroom that you like. Brie cheese can be used in place of the camembert in the Bechamel sauce. Use regular cooked lasagna noodles if you wish. This is not a low fat or low calorie dish. Save it for special occasions when you can splurge. Order a Rabbit from D’Artagnan. Even our dog Atticus loved my white rabbit lasagna. 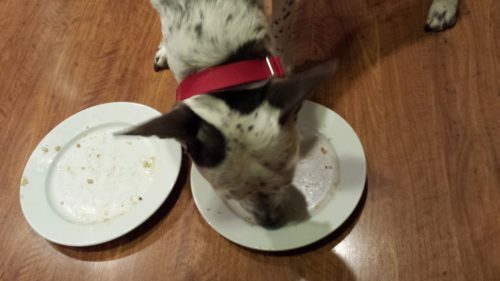 Here he is licking our plates!